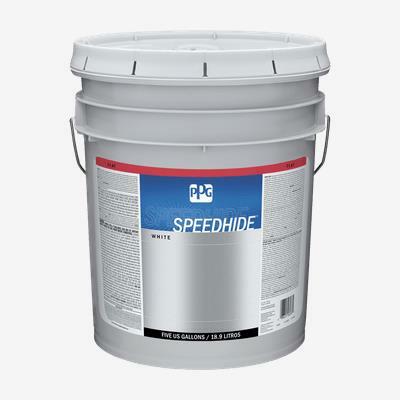 SPEEDHIDE® SUPER TECH® MG Interior Epoxy Ester Dry-Fog is a premium, low odor, high solids product designed for interior ceilings and overhead surfaces. With its excellent adhesion to a variety of substrates, this dry-fog may be used direct-to-metal in interior, dry areas and as a single coat finish on most surfaces. Designed for excellent hiding at a reduced film thickness, less paint is needed to create a uniform finish. SPEEDHIDE® SUPER TECH® MG Interior Epoxy Ester Dry-Fog will yellow less than conventional alkyd dry-fogs. Its higher hiding white finish has high light reflectance that dry falls in 8 feet under normal conditions. It is ideal for gymnasiums, commercial warehouses, factories, retail outlets, parking structures.